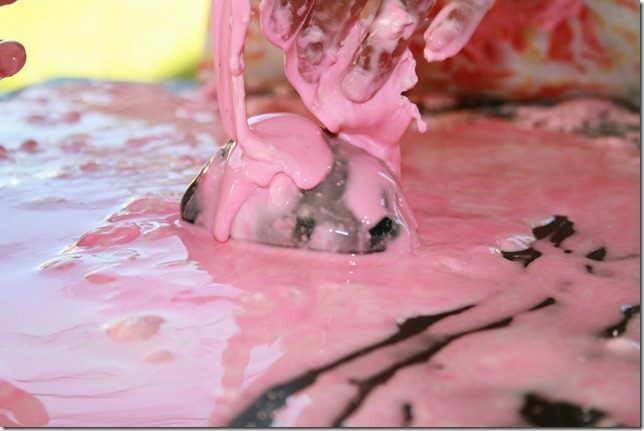 Slime – our sure shot entertainer. This stuff has NEVER failed in our household. Be warned that this is a very messy activity. If your kids are into the whole body experience, do this ONLY when you are ok with a whole of a mess. After the initial “Oobleck oobleck” chanting died down, the girls put their hands in the bowl and started squishing the goop around.. Baby A keeps saying “cushy cushy (squishy squishy) and also thinks my “two kids” tummy is play doh. That kid is all about sensory stuff. 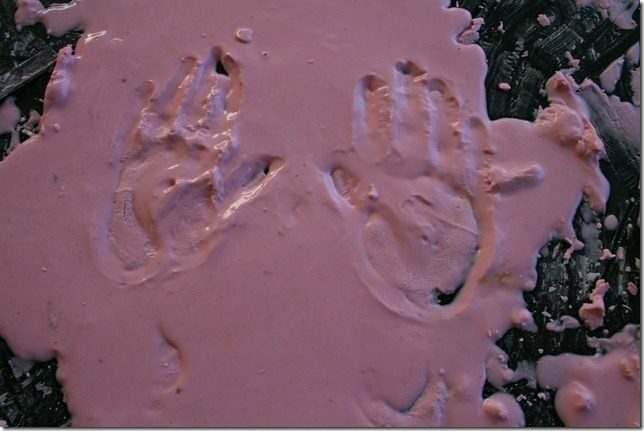 Pouring goop all over your hands and sis’s hands and back of her palms ( stopped at hands because mom was watching) was super fun for the kids. I usually don’t orchestrate their play except setting up with the materials and supervising them so that they don’t go straight to phase 3. Big A is pretty good in that area. Good that she will clearly avoid the supplies I setup for her and will go get her own things. There was this one time when baby A asked for a marker to paint/write on white play doh!! 20 minutes into the play – PHASE 2. This is when their imagination kicks in and whatever play-based learning should happen, happens now- in this precious time. On this oobleck filled afternoon, the sisters apparently decided that messing around with goop inside the bowl is not as much fun as pouring them on the table. 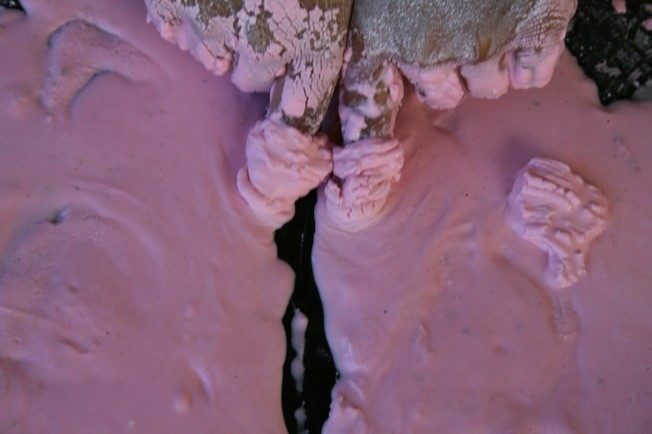 Started off with taking goop with their hands and slowly pouring it on the table while trying to make patterns with the too-cute-for-words pink river/sea. Made lots of patterns that looked spooky. Actually one looked like a butterfly. Used both her pointer fingers and started separating the “pink sea”. Once separated, the two goop portions quickly flowed towards each other. Big A cheered wildly when the goop flowed together. 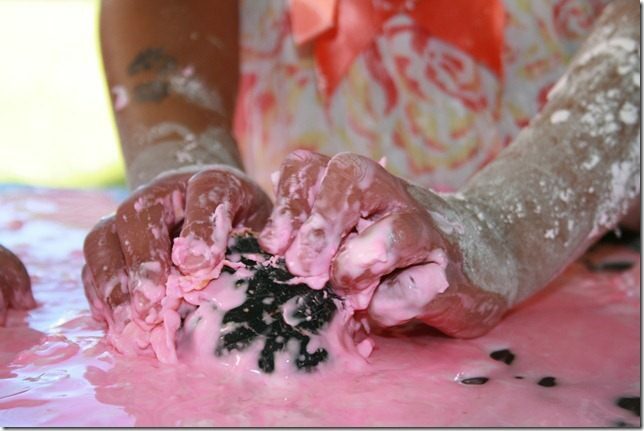 After the table was covered in oobleck, she made a pizza and pretended to cut into slices. Plastic knives would have been great but Big A was very happy with her index fingers. Picked up a smooth stone and poured goop all over it and made a birthday cake for the stone while screaming singing Happy Birthday. Huge hit here was the “Case of the disappearing hand prints” Once pressed firmly, the hand prints kind of dissolve in front of your eyes. Begin “monkey business” phase. A.K.A “way too much fun” phase. This is when the girls got super excited and started the whole body experience. Made the oobleck into balls and stuck it to the ends of sticks, bubble wands and any other pointy objects lying around. Once stuck, Big A decides it is a cotton candy (with the pink and all). Then she goes BAM! on the table with the stick. Flying oobleck ! She actually asked for a oobleck fight. May be I’ll let her do it on the grass when her friends come over. Mommy S comes back and sees a more than happy pink baby and a giggly big sister. This is when I realize that 30-45 minutes is how long my 3.5 year old can follow directions and still have fun. After that, at least at home ( they seem to be well behaved at school), they kind of get fidgety and lose focus. If their focus is to have messy fun, sure that’s never lost. 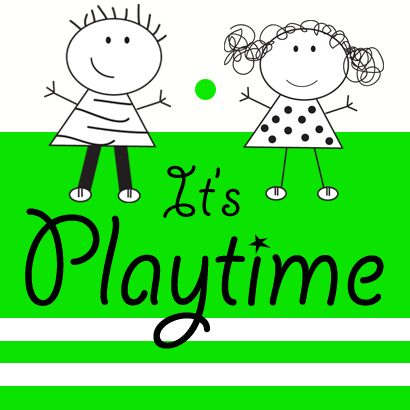 But if the focus is to have messy fun while staying with in the boundaries, oh man! then that sure is lost. We pack up, participate in clean up ( hosing down the entire patio) and then curtains down for the afternoon’s messy play without any tears.